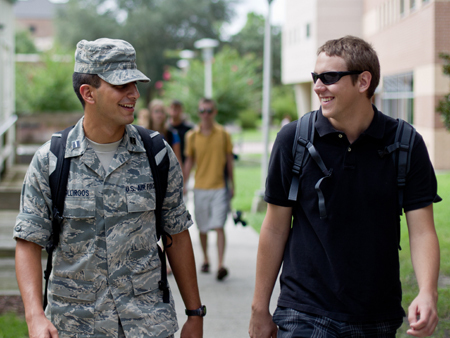 Student veterans are provided with mentoring and special academic support services beginning when they first arrive at UCF. A commitment to easing the transition from boots to books has earned the University of Central Florida a spot on a national list of “military friendly” schools. For the second year in a row, G.I. Jobs magazine named UCF among the top 15 percent of universities, private and community colleges and trade schools in the country that make recruiting and retaining military and veteran students a priority. G.I. Jobs, which targets veterans looking for post-military success, reviewed more than 7,000 schools for its annual list. The publication selected the schools that best support student veterans and offer them the most outstanding education, value and welcome. Student veterans are provided with mentoring and special academic support services beginning when they first arrive at UCF. The university’s Veteran Services office educates staff and faculty members about how to help students adjust to civilian life and how to support veterans with post-traumatic stress disorder. UCF also has ranked highly on a Chronicle of Higher Education list of national institutions that enroll the most students with veteran benefits. UCF enrolls more than 1,600 veterans with federal education benefits, and the university was one of the only large public institutions not located near a military base on the Chronicle’s top 25 list from 2008. UCF will honor the service of all veterans this fall with the addition of a “Veterans Commemorative Site” on the south end of Memory Mall. The site, designed by Navy veteran Don Reynolds of Sanford, will feature a U.S. flag in the center encircled by a cast-bronze coupling that joins five horizontal marble columns capped by sculpted replicas of the U.S. Armed Forces seals. For more information about the site, or to make a donation, go to www.foundation.ucf.edu/veterans-commemorative-site. UCF will not spend student tuition dollars or state money on the project. To learn more about UCF Veteran Services visit http://www.va.ucf.edu.